In the early period of the county "old field schools taught only reading, writing, spelling and arithmetic. These were sustained by tuition fees which were about $1.00 a month for a pupil. The expenses of orphans or very poor children were paid by the state. There were a few neighborhood schools where families clubbed together and hired a good teacher for their own children. Some of the wealthy plantation owners employed tutors or governesses." By 1840 there were about 14 "old field schools" across the county. Tuition was between one and two dollars a month per pupil. By 1850 there were about 18 common schools. Taxes were appropriated started in 1859 by the state legislature for the creation of public schools. Teachers were examined and the following were qualified in 1859: William T Phillips, James Dodson, J G Calhoun, Oliver L Fussell, Martha Smith, Thomas J Smith, W W Kennerly and William Hoover. the county of Marion. Nov/Dec 1832. Source: Acts of the General Assembly of the State of Georgia, Passed in Milledgeville at an annual session in Nov and Dec 1832. Diaz and Joseph Mott. Tuition fees were $5.00 per month for each pupil. No longer in operation by 1840.
and Silas Stephens. Dr I W Savage was the first principal of the Academy. December 22, 1834. Tuition fees were $5.00 per month for each pupil. No longer in operation by 1840. Marion Academy was charted by the state legislature Dec 28, 1828. On the Board of Trustees were: William Brooks, Joseph C Brooks, William Wells, John R Senmore and Wiley Williams. The Academy was reorganized December 22, 1833. New trustees were A F Temples, James Newberry, Andrew Burns, Burton W Dowd, Whitfeld Williams and William Maddux. Tuition fees were $5.00 per month for each pupil. No longer in operation by 1840. 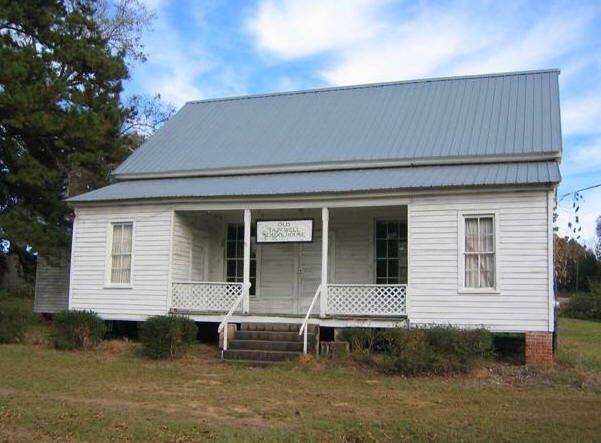 "One of the first schools established in Marion County was located in the Red Bone District, now Brantley, near the large black gum tree in front of the residence of Mrs Bessie Burt, a short distance from the large spring which is the head of Kinchafeenee Creek. According to information received from Judge R G Noell this log house with its huge rock chimney and wide fireplace was constructed about 1830. This community was settled by substantial intelligent pioneers who realized that education was the foundation of advancement and proper development. For thirty years the children in that neighborhood attended school there and were instructed by men of courage and perseverance. Among the early patrons were Enock Allman, Jones and Harris Brantley, H Z Burt, William Boothe, James Green, William Hardage, William McGaugh, Moses Paul, James and Henry Patillo, Harey Mitchell, David Reddick, A. M. Sheppard, B Story, Jesiah Story, John Simmons, Nathan Short, Lott Williams, George Walker, James Wadsworth and W J Yarbrough. Among the outstanding teachers were Rev W J Short and Hollis Belk." "In the late fifties the patrons of this school employed W R Attaway and Mr Scoggins to construct the one room frame house with eight glass windows. Rev W J Short was the teacher in charge when the neat new building was completed and moved his pupils and educational equipment there in 1860. The only living students who attended school there at that time are Mrs Elizabeth Short, James I and J T Green. In 1862 Rev W J Short resigned his position here and enlisted in the Confederate Army. He resumed his work as a teacher and taught until 1868." Burch and C B Strange. Tuition fees were $5.00 per month for each pupil. Still in operation beyond 1840. "Dr W. J. Reese, County School Commissioner. Population, white: 1,193, colored: 1,755. Total: 2,948. Decrease, 39, 1%. Illiteracy: White 16%; Colored: 39%; total: 30% . The attendance upon the monthly institutes which were held at Buena Vista ranged from 25 to 30. There are 41 teachers in the county. The annual institutes held in August had an average attendance of 30. Prof W. Harper of Americus was the expert. Dr Reese in his remarks said he institutes have been very beneficial to the teachers. Fines imposed $4.00."